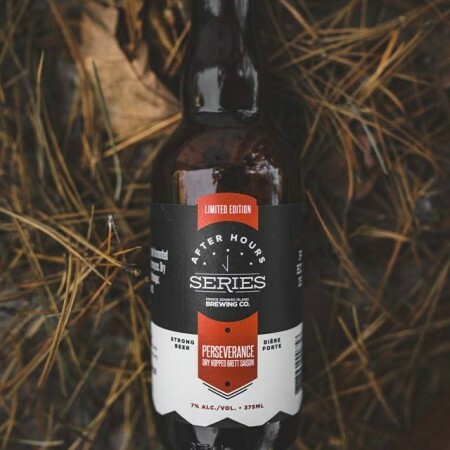 CHARLOTTETOWN, PE – PEI Brewing has announced the release of the latest in its After Hours Series of limited edition one-off beers. Perseverance (7% abv) is a Belgian-style farmhouse saison that was fermented with three strains of Brettanomyces, dry hopped with German Tettnanger hops, and bottle conditioned. Perseverance is available now in 375 ml bottles at the PEI Brewing taproom and retail store. It will also be available alongside the previously released Cuvée La Joye Belgian Golden Strong Ale and two other new beers at the After Hours Spring Release taking place this Thursday April 12th at the brewery. For more details, see the Facebook event listing.